Eric F. James will focus on the genealogy research produced by the Jesse James family covering 1882 to the present day. He will address its genesis, methodologies, participation, DNA study, discoveries, challenges, peer review, financial costs, continuing burdens, privacy issues, publication and resulting new ancestry, new history and new family. Much of the James family’s history was lost as the family disintegrated following the assassination of Jesse James. Interest in the family genealogy revived in 1950, through one family member’s slip of the tongue that broke the family’s wall of silence. Eric F. James will cover what new and unexpected discoveries arose since and the new history that now compels the genealogist to write a five-volume history of the Jesse James family. Eric will preview This Bloody Ground, Volume II of Jesse James Soul Liberty. His second volume focuses on Frank and Jesse’s grandfather, John M. James, his origins in the American Revolution with the Youngers and Pence, and his self-exile into Kentucky with the Traveling Church, which became a predicate to socio-religious communities and political structures of today. Eric will discuss the Spanish Conspiracy that first ruined the James reputation at a point when John M. James had become a political catalyst against bankers and predatory lenders of the early 19th century. Within John’s witness to the Danville conventions, statehood and his founding of Pulaski County, associations were formed that would lead to the infamous James Gang and confrontations of the Civil War era. 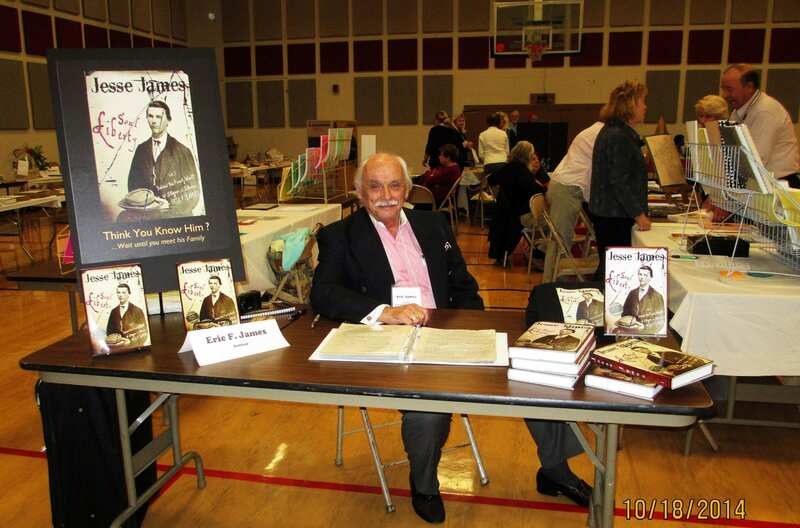 The author and genealogist also will sign his Volume I of Jesse James Soul Liberty. 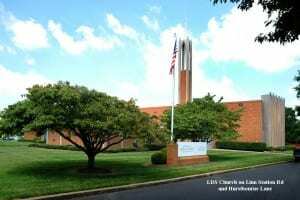 Eric last visited the Louisville Genealogical Society in October of 2014. For those who read about Jimmy Keating on page 196 in Volume I of Jesse James Soul Liberty, here’ s some supplemental information that didn’t make it into the book. 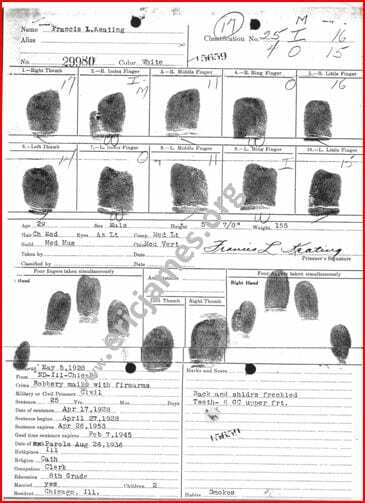 The first is the fingerprint card for Francis Lawrence “Jimmy” Keating from Leavenworth Prison where he was incarcerated, following his train robbery with Jimmy Holden. The second is Keating’s FBI WANTED bulletin, issued by J. Edgar Hoover following Keating’s escape from Leavenworth Prison. Jimmy Keating is still a wanted man. I continue to research for new information about him. For years, I’ve tried to learn more about his Keating genealogy. 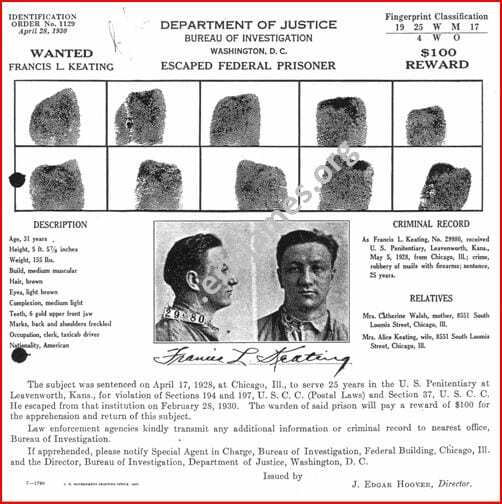 In recent weeks, I was contacted by one of his cousins and have been able to expand my knowledge about this silent and elusive criminal, who by chance became related to the James family. As the James-Keating family cousins were unaware of the cousin who contacted me, the contact cousin was also un-knowledgeable about his James-Keating cousins. I don’t foresee a family reunion in their futures, however. I have enough material to write a book about Frances L. Keating, but my accumulated research is far from complete to tell Keating’s entire story. Presently in particular, I’ve been looking for information about one of Keating’s brothers, Robert “Bob” Keating, who died in Kansas City, according to a letter Jimmy Keating wrote when he learned in prison about his brother’s passing while reading the Kansas City Star. From the documentation I have in hand, it’s clear Keating had outside support, both in the political community and among organized labor. Keating’s retirement was spent as president of a boiler maker’s local. I don’t believe more information about Keating will lead to where Jimmy Hoffa is buried. I don’t care about that. I do believe, though, from an historical point of view that James L. Keating was as interesting an outlaw as Jesse James. One noticeable difference between Francis Keating and Jesse James is that Keating had the superior penmanship, and he could spell correctly. That’s the difference between graduating 8th grade and being home schooled. Singer Pat Boone’s recent birther claim has turned on him. Against all evidence, Boone has claimed he will produce proof that President Barrack Obama was born in Kenya. Boone, it seems, now is called upon to produce evidence that he is a descendant of Daniel Boone, as he claims. The challenge for Boone is to produce bona fide proof of ancestry connecting him to Kentucky explorer Daniel Boone, or fall suspect that his own perma-dark complexion indicates that Pat Boone also may be foreign-born. Los Angelinos recall Pat Boone in his semi-retirement during the 1970’s. 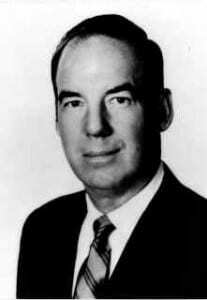 Boone was a periodic guest on the daytime television show of former L.A. mayor Sam Yorty. The mayor, an arch Republican like Pat Boone, was proudly tickled any time Boone claimed to be descended from the famed frontier woodsman Daniel Boone, which Pat Boone did fairly regularly. Yorty was fond of associations like that. He eagerly friended many of Hollywood’s celluloid products. 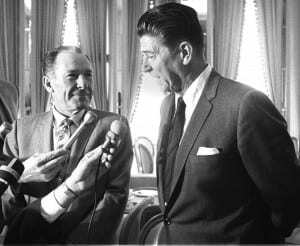 Favorites were California Senator and actor George Murphy and actor and later Governor Ronald Reagan. Yorty also was a Republican Party associate of Evelle J. Younger, whom Yorty assisted in electing as California State Attorney General, following Younger’s service under Yorty as Los Angeles County District Attorney. Younger never claimed his kinship with the Younger brothers of the James-Younger Gang. Had Yorty known of it, everyone else might have known it. Yorty was a master promoter. Presently, internet challenges claim Pat Boone is NOT a descendant of Daniel Boone. Like birthers, however, the faux genealogists making such claims can only point to error laden internet databases to support their charge. It is doubtful any of the genealogy bloggers has ever smelled a musty public records book, or have descended into any dank, dimly lit courthouse basement to conduct physical research of their own. Here at Stray Leaves, Charles Eugene Patrick Boone’s genealogy and link to Daniel Boone is accepted, as is the word of Pat Boone, until proven any different. This acceptance has withstood publication for 15 years or more, leaving ample room for any disproof to appear in that time. 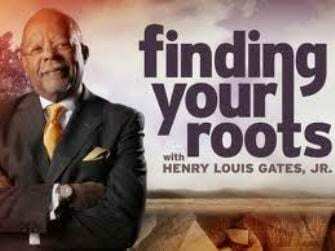 Despite America’s rampant enthusiasm for genealogy, and especially celebrity genealogy, no proof has surfaced. Who’s to say, though, if genealogists approached Pat Boone’s ancestry from a political perspective? Having been born in Florida a descendant of Daniel Boone may not be acceptable to some beliefs. A more desirable attitude would be to discredit Pat Boone, his ancestry, and his birthroot. He’s not a descendant of Daniel Boone at all. His perma-complexion indicates Pat Boone is the native of a foreign Caribbean country instead, and Pat Boone’s U.S. citizenship should be under consideration as revocable, together with his recording royalties. Stray Leaves eschews such unethical genealogy practice, as it also eschews the birtherism practiced by Pat Boone among others. In the practice of genealogy, birtherism holds no place. One’s family claim is respected until proved otherwise by reputable research. 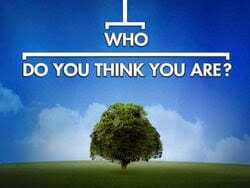 When disproved, the genealogy stands corrected. The only defense of birtherism among genealogists is to be factual, prove your own, and produce the proof of those you claim is false. Ante up your own factual record first, Pat Boone, before attacking others.